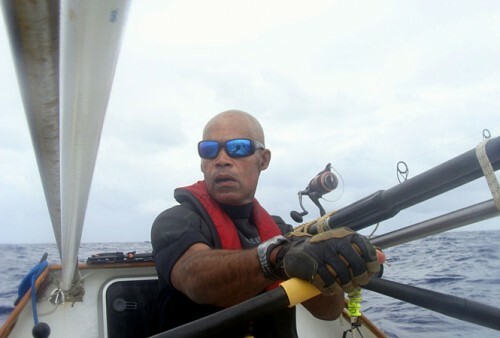 Victor Mooney rows the Spirit of Malabo in the Atlantic Ocean. Mooney who hopes to cross the Atlantic Ocean in honor of his brother who died of AIDS in 1983, passed the halfway mark, Sunday, May 11, 2014. He has tried the same feat three other times, without success. NEW YORK — An American rower hoping to cross the Atlantic Ocean in honor of his brother who died of AIDS has passed the halfway mark. A spokeswoman for 48-year-old Victor Mooney said early Sunday the specially built oceangoing rowboat had done more than half the 3,000-mile journey from the African coast to the British Virgin Islands. Mooney set off Feb. 19 in a 24-foot boat from Maspolamas, Gran Canaria. His journey is being done in honor of a brother who died of AIDS in 1983, and another who is living with HIV. Mooney is hoping to encourage voluntary HIV testing. Mooney has tried the same feat three other times, without success. He hopes to resupply in the British Virgin Islands then row back to New York. Successful crossings happen annually, according to statistics kept by The Ocean Rowing Society.